I made this absolutely yummy and healthy bhel as an after-school snack for my daughter and she just loved it! If you have your sprouts ready, it takes just a couple of minutes to assemble the ingredients to make it. With the crunch of sprouts and raw veggies tossed in a sweet dates chutney, topped with the flavour of mint, this snack is really going to impress kids and adults alike. 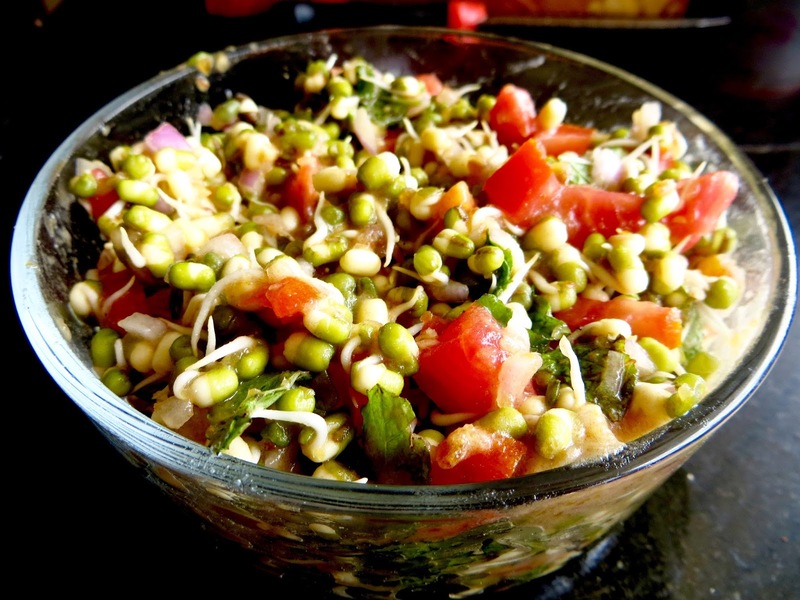 I have used organic whole moong dal for sprouting in this recipe. Just soak the moong dal for around 6-8 hours after washing and rinsing it nicely. Drain the soaked water, and then rinse it once more. Place the rinsed moong dal in a moist cotton cloth for the next 10-12 hours for sprouting to happen. Finely grate the carrots, and chop the onion and tomatoes. Grind the dates and a few leaves of mint to a fine paste. Toss together the sprouts, veggies, black salt and the dates paste. You can also add red chilly powder and chaat masala if you like. This entry was posted in 30 minutes recipes, Vegan . Bookmark the permalink.